Increased composite thermal conductivity through the addition of silver nanowires. Modulating the electrical conductivity of flexible or fiber reinforced composites using copper nanowires, silver nanowires, or carbon nanoparticles. Improving the dielectric properties of composites for high energy density capacitors using shaped metal oxide nanoparticles. NanoComposix has partnered with researchers at UCLA to develop a new class of self-healing composite materials. 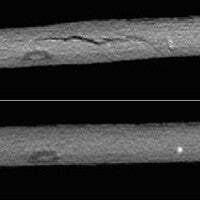 These composites are capable of healing subcritical damage including delamination and matrix cracking. They form the basis of a system that will continuously monitor composite health, and automatically repair any damaged areas. For more information, please contact Dr. Tom Darlington.